Orioles pitcher Zach Britton added another line to his extremely impressive Spring Training resume yesterday, pitching five innings and allowing just one earned run against the New York Yankees. That single earned run was Britton’s first of the spring in 14 innings pitched. The 23-year old lefty has allowed 14 hits in those 14 innings, struck out nine and walked only four. His fastball was hitting 96 yesterday on the radar gun. Despite his strong Spring Training, chances are very slim that Britton will make the trip north with the team to start the 2011 campaign. As Dan Connolly explains, Britton is in the same boat that players like Matt Wieters and Brian Matusz before him found themselves in, with the team not wanting to start their service clock too early. Simply put, if Britton begins the year on the major league roster and remains on it for all of 2011, he will earn one full year of service time. Assuming he continues as a major leaguer after that, he will be eligible for free agency after the 2016 season. However, if Britton is not recalled until April 21 or later, he will not be credited with a full year of service time, meaning he will not be eligible for free agency until after 2017. For a team that is hoping to collect quality young starters, keeping a pitcher like Britton in the minors for three weeks in order to retain him for an additional season is crucial to that development plan. In addition, the O’s schedule is such that – with early season off-days and whatnot – they likely won’t need a fifth starting pitcher at all until at least mid-April. All of this means that Zach Britton will likely have a chance to dominate AAA hitters for the immediate future. Barring any setbacks, though, expect to see this young arm showing up in Birdland sooner rather than later. I’m not too worried about that though. It is still March, after all. Every game that Roberts plays is good news at this point, regardless of what his stats are. 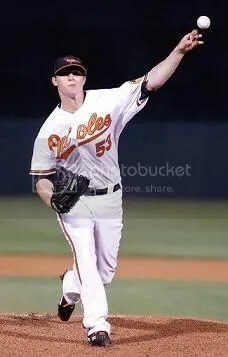 This entry was posted on March 23, 2011 at 9:38 am and is filed under Orioles, Spring Training. You can follow any responses to this entry through the RSS 2.0 feed. You can skip to the end and leave a response. Pinging is currently not allowed.